Definition at line 67 of file lluistring.h. Definition at line 72 of file lluistring.h. Definition at line 41 of file lluistring.cpp. Definition at line 74 of file lluistring.h. Definition at line 48 of file lluistring.cpp. References format(), mOrig, and s.
Referenced by LLLineEditor::handleSpecialKey(), LLUIString(), operator=(), LLTextBox::setText(), and LLLineEditor::setText(). Definition at line 93 of file lluistring.cpp. References mOrig, mResult, and mWResult. Referenced by LLPieMenuBranch::buildDrawLabel(), LLMenuItemBranchDownGL::buildDrawLabel(), LLMenuItemBranchGL::buildDrawLabel(), LLMenuItemToggleGL::buildDrawLabel(), LLMenuItemCheckGL::buildDrawLabel(), LLMenuItemGL::buildDrawLabel(), LLLineEditor::clear(), and LLMenuItemCheckGL::handleEvent(). Definition at line 101 of file lluistring.cpp. Definition at line 88 of file lluistring.h. Referenced by LLMenuItemGL::draw(), LLButton::draw(), and LLLineEditor::getXML(). Definition at line 75 of file lluistring.cpp. References mResult, mWResult, and wstring_to_utf8str(). Referenced by LLLineEditor::addChar(), LLLineEditor::deleteSelection(), and LLLineEditor::removeChar(). Definition at line 108 of file lluistring.cpp. 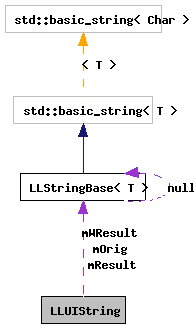 References LLStringBase< char >::format(), mArgs, mOrig, mResult, mWResult, and utf8str_to_wstring(). Referenced by assign(), LLUIString(), setArg(), and setArgList(). Definition at line 82 of file lluistring.h. Referenced by LLLineEditor::addChar(), LLIMMgr::addSystemMessage(), LLMenuItemGL::buildDrawLabel(), LLMenuItemBranchDownGL::draw(), LLMenuItemGL::draw(), LLLineEditor::draw(), LLScrollListText::drawToWidth(), LLMenuGL::getLabel(), LLMenuItemGL::getLabel(), LLTextBox::getText(), LLScrollListText::getText(), LLLineEditor::getText(), LLLineEditor::getXML(), LLLineEditor::handleKeyHere(), LLLineEditor::handleSpecialKey(), LLLineEditor::isDirty(), notify_cautioned_script_question(), LLLineEditor::onFocusLost(), LLFloaterAnimPreview::postBuild(), LLPanelLandGeneral::refresh(), LLLineEditor::resetDirty(), LLPanelGroupVoting::impl::setEnableVoteProposal(), LLLineEditor::setText(), and LLColumnHeader::showList(). Definition at line 85 of file lluistring.h. Referenced by LLLineEditor::copy(), LLLineEditor::cut(), LLLineEditor::doDelete(), LLMenuItemBranchDownGL::draw(), LLMenuItemGL::draw(), LLLineEditor::draw(), LLTextBox::drawText(), LLScrollListText::drawToWidth(), LLLineEditor::findPixelNearestPos(), LLMenuItemBranchDownGL::getNominalWidth(), LLMenuItemGL::getNominalWidth(), LLTextBox::getTextPixelWidth(), LLLineEditor::getWText(), LLLineEditor::handleDoubleClick(), LLLineEditor::handleKeyHere(), LLLineEditor::handleUnicodeCharHere(), LLLineEditor::nextWordPos(), LLLineEditor::paste(), LLLineEditor::prevWordPos(), LLLineEditor::setCursor(), LLLineEditor::setCursorAtLocalPos(), and LLTextBox::setLineLengths(). Definition at line 81 of file lluistring.cpp. Referenced by LLLineEditor::addChar(), and LLLineEditor::paste(). Definition at line 89 of file lluistring.h. Referenced by LLLineEditor::addChar(), LLLineEditor::canDoDelete(), LLLineEditor::doDelete(), LLLineEditor::draw(), LLScrollListText::drawToWidth(), LLLineEditor::getLength(), LLLineEditor::handleDoubleClick(), LLLineEditor::handleHover(), LLLineEditor::handleSelectionKey(), LLLineEditor::handleSpecialKey(), LLLineEditor::LLLineEditor(), LLLineEditor::paste(), LLLineEditor::selectAll(), LLLineEditor::setCursor(), LLLineEditor::setCursorAtLocalPos(), LLLineEditor::setCursorToEnd(), LLLineEditor::setSelection(), LLLineEditor::setText(), and LLLineEditor::updateHistory(). Definition at line 83 of file lluistring.h. Definition at line 86 of file lluistring.h. Definition at line 77 of file lluistring.h. Definition at line 87 of file lluistring.cpp. Definition at line 60 of file lluistring.cpp. Referenced by LLFloaterBump::add(), LLFloaterNewIM::addAgent(), LLFloaterIMPanel::addTypingIndicator(), LLCurrencyUIManager::buy(), LLFloaterIMPanel::init(), LLFloaterAbout::LLFloaterAbout(), LLIMMgr::noteOfflineUsers(), notify_cautioned_script_question(), LLScriptEdCore::onHelpComboCommit(), LLPanelDisplay::postBuild(), LLFloaterLandHoldings::postBuild(), LLFloaterAnimPreview::postBuild(), LLPanelPlace::processParcelInfoReply(), LLPanelLandGeneral::refresh(), LLPanelGroupVoting::impl::setEnableVoteProposal(), LLScriptEdCore::setHelpPage(), LLMenuItemGL::setLabelArg(), LLLineEditor::setLabelArg(), LLButton::setLabelArg(), LLTextBox::setTextArg(), LLLineEditor::setTextArg(), LLFloaterBuy::show(), LLFloaterJoystick::show(), and LLColumnHeader::showList(). Definition at line 54 of file lluistring.cpp. Definition at line 66 of file lluistring.cpp. References mResult, mWResult, LLStringBase< T >::truncate(), and wstring_to_utf8str(). Definition at line 109 of file lluistring.h. Referenced by clearArgs(), format(), setArg(), and setArgList(). Definition at line 106 of file lluistring.h. Referenced by assign(), clear(), and format(). Definition at line 107 of file lluistring.h. Referenced by clear(), erase(), format(), getString(), insert(), operator LLString(), replace(), and truncate(). Definition at line 108 of file lluistring.h. Referenced by clear(), empty(), erase(), format(), getWString(), insert(), length(), operator LLWString(), replace(), and truncate(). Definition at line 101 of file lluistring.h.